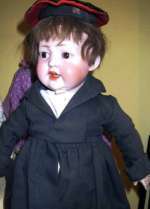 19" rare charachter boy made by The German Company Kley and Hahn. This is a lovely 19" rare charachter boy made by The German Company Kley and Hahn. He has an adorable face with sculptered opened/closed mouth! The tounge is modelled in the bisque. Great big brown eyes!He has an auburn real hair wig, the bisque is in a fine quality. He has a minimal chip (unvisiable) at the corner of his left eye. ( Therefore I have reduced the price on him with 30 % ) This came probaly as the eyes were sat in by the company, so it is not a major thing! He is on a great toddler body in wonderful condition. He is wearing his original clothes and hat. underwear, stockings and shoes. He is such an attractive boy! He would be so lovely to add to your collection of character dolls!.Do ask for more pictures! Size 19". Simon and Halbig boy, Modelled hair. Bisqueboy, shoulderhead on kid/fabric body w. bisque arms. He has big blue paperweight eyes.Closed mouth. Nice painting. Original black boys dress. Very good condition.He is proberly from Simon and Halbig. Size 39 cm/15 inches. This is a very sweet By Loe baby doll designed by Grace Putmann, made by Kestner, Germany circa 1910. Head made of very pale bisque in excellent quality. Blue eyes, modelled hair, close moth and a sweet flat nose!. Just like a new born baby! She is on the special designed "frog formed" fabric body with celloid hands. All over original and in great condition! She wears a pretty antique batiste and lace christening gown , with and the finest laces. She is 18" ( 45cm) tall . This baby is the so cute and in a large size. Absolutely adorable!!! Dollhouse doll.Bisque dollhouse man/golf player.He wears a great modelled hat and is drssed in his very nice original woolen outfit .Ca 1900. Brown suit with knickers, modelled stockings,w. wih patterns, brown gloves and shoes. A very rare original doll. 18cm/7inches tall.Also a fine driver fo ran early tinplate car or carriage. 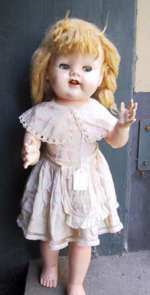 Fine Celluloid girl doll from 1950. Marked JKK.Danish. Fine Celluloid girl doll from 1950.Originally dressed. She is in good condition. Size 28 cm/10 1/2". Clothes original. 50 cm English walking doll. 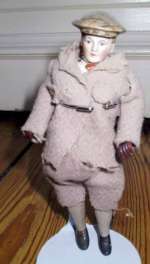 English "walking"doll.1930-40. She is marked BGI London on the back of her head.She wear her original dress with label and original underwear. Her hair is blonde mohair. Blue sleeping eyes with eyelashes. She is made of a sot of hard vinyl. She is from circa 1940.